Amaranth is an ancient grain similar to quinoa used by the Aztecs and Mexicans; it is also used in India to make a sweet. There is very little flavour to amaranth, but when popped it adds a nice texture, similar to puffed rice. Heat a saucepan without any oil. When hot, add the amaranth and immediately put a lid on the pan. The grains will start popping within seconds. As soon as the popping has stopped, remove the pan from the heat. Mix the sweetener with the yogurt if using. 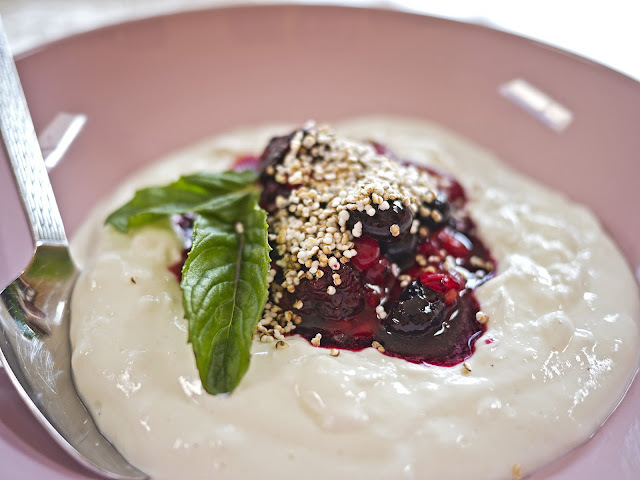 Place in a bow, top with the berries and the popped amaranth.